Abused Animals Find Refuge In A New Sanctuary In Jordan : Parallels A new wild animal preserve has opened its doors to rescued wildlife in one of the Middle East's biggest animal trafficking routes. Here's a look at that sanctuary. 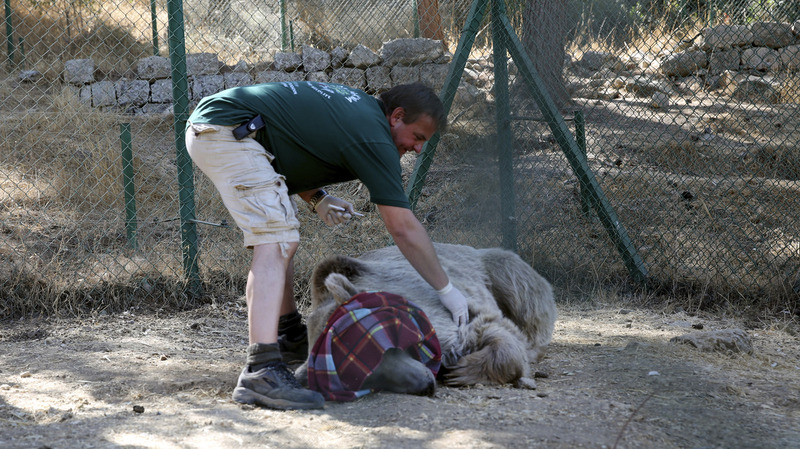 A caretaker examines a bear named Balou to be sure he's fully sedated before he's moved from a center near Amman, Jordan, to the al-Ma'wa wildlife reserve in northern Jordan on Oct. 2. The bear and other animals were released into the reserve run by the Princess Alia Foundation. The animals were rescued from abusive conditions. When two starving lions were brought to Jordan this year from an animal park in the Gaza Strip, the animals had never set foot on anything but concrete and metal. The lions — Sultan and Sabrine — are among the first inhabitants of a new wildlife preserve that opened in October amid almost 350 acres of protected forest. The animals will live in large enclosures in their new home. "It was the first time ever they had been off concrete. It was the first time ever they had felt a tree," says Sarra Ghazi, the head of Jordan's Princess Alia Foundation, which runs the al-Ma'wa wildlife preserve. "Sultan loves putting his head up and scratching his face in the branches." The foundation and the international animal welfare group Four Paws opened the sanctuary to provide homes to an increasing number of wild and exotic animals rescued from traffickers, abusive owners or poorly run zoos. Jordan is a major stop on the global animal trafficking route. Many of the animals are bred in zoos or farms in Jordan, Iraq and Syria to be smuggled to rich Arab Gulf states, where lions, tigers and monkeys are popular pets among the wealthy. Ghazi says the two recently arrived lions had been smuggled as cubs through tunnels from Egypt to Gaza. When they arrived in Jordan, they were gaunt, with sunken eyes. War with Israel and an embargo on Gaza had left the Gaza zoo with no way to feed the animals that had survived the shelling. Stuffed dead animals were displayed near the live ones. Four Paws called it "the worst zoo in the world." The lions "needed a lot of physical care, but mentally, they were so damaged," said Ghazi. "I'll never forget watching them one day and a car was driving past and backfired. These two huge lions hit the ground. To see that in an animal — if that is happening, if that's the impact of such a terrible war on a lion, what are the people and those children there suffering?" The $5 million sanctuary north of Amman is funded partly by the Abu Dhabi government in the United Arab Emirates and will include an eco-lodge and a visitors' program meant to raise awareness about animal trafficking. A planned second phase of construction will make the wildlife preserve the biggest in the Middle East. Ghazi says they realized they would need more space when they found that some of the lions and tigers being sent back to native habitats in Africa were being resold as pets or to hunting farms where they would be shot and killed. There are five other lions at al-Ma'wa, along with two tigers and a Syrian brown bear named Balou, rescued six years ago from an abusive private zoo in Jordan. "To get him out of his night room, they would beat him," says Ghazi. "He was so hurt he would come out and they would lock him into the exhibit area, which was completely bare, and he would be faced with screaming crowds poking and prodding and throwing things at him." 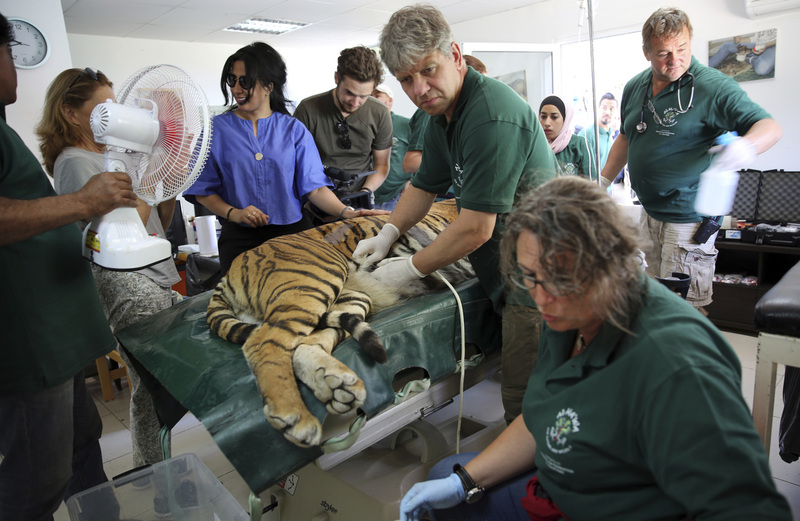 A sedated tiger is examined before being moved to al-Ma'wa wildlife reserve in northern Jordan. Balou weighs more than 600 pounds with long claws and sharp teeth, but he was traumatized and terrified by the sight of people. For months after he was brought to the foundation's original sanctuary near Amman, Ghazi would spend hours every day sitting outside his enclosure with apples and honey, to try to make him feel safe. "He is an incredible soul," she said. "To have the heart and ability to forgive and learn to trust again that is something that we could really learn from." She says that at his new home, Balou has started digging in the earth behind his stone den, indicating he might have reverted enough to natural behavior to hibernate. The latest arrivals include a lumbering black vulture found on a farm, a tiny owl blinded when local people tried to capture him and a striped hyena found with her legs bound together and her muzzle tied. An indoor enclosure holds some of the more than 60 pythons seized at the border with Saudi Arabia. The foundation releases species native to Jordan back to the wild when they are well enough. The keepers minimize contact with the animals to allow them to try to lead lives that are as natural as possible. But some of the animal residents have been brought up among people and welcome the contact. As we talk, a young baboon reaches through the bars of an enclosure and grabs Ghazi's necklace and then her hand before being distracted by the microphone. He reaches out and starts grooming the fuzzy cover, chattering and looking for insects with his long, slender fingers. Ghazi said one success story was a pelican from the Gaza zoo, brought to Jordan by Four Paws at the same time as the lions. "It was the first time ever it had eaten fish. It was the first time ever it could get in a pool of water," she said. "We were able to move the pelican down to the bird observatory in Aqaba, and a group of migrating pelicans came and have taken him with them. So he's now free. From a zoo in Gaza, he's now free and migrating."